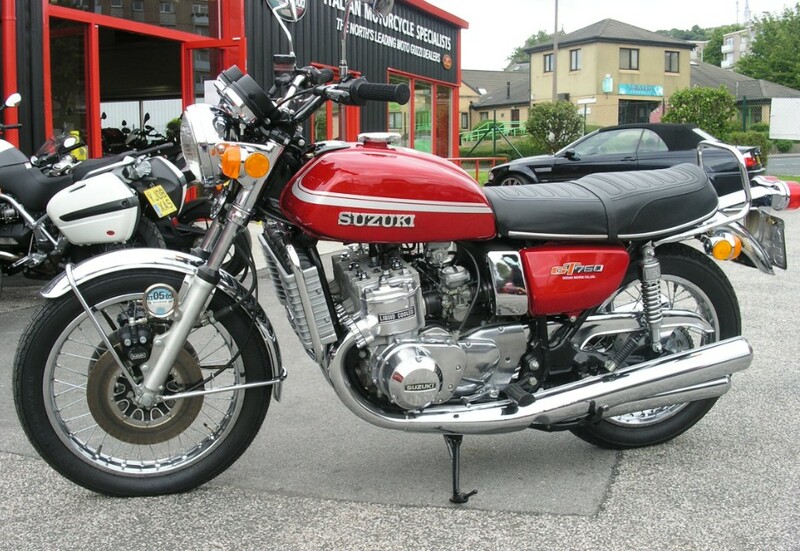 This is Glen Reay"s 1975 Suzuki GT 750 M machine, it was imported the U.S.A. in 2008. It's an original condition bike it hasn"t been "cheque book" restored. Glenn having carried out some light renovation work, replacement of warning decals, cables, oils, plugs, etc but apart from many hours of polishing and T-cutting the frame in particular this bike is still the same as it came out of its crate back in 1975. The owner also has a 1974 model L" GT750 which is currently undergoing some light renovation and rechroming of shiny parts as it sat in someones garage in Connecticut for over 25 years,!! Again all original and very few new parts added. Glenn is 50 years old and has been involve with GT suzuki in particular since he was 17 years old! He had a part time job after school when 16 building up these bikes from their crates for showroom display or sale for a local family dealer in bradford. He wanted to get hold of an original as possible machine as restoration is fine if there is no other alternative but Glenn finds many people "bling" up their bikes when restoring them, which is way past the original factory finish on these early 2 -stroke machines.